Each Pearlman's Vintage piece of jewelry begins as raw material. Pure Platinum, Gold and Palladium are melted to form an ingot, which is then rolled into sheets or drawn into wire. This simple form of metal working is the essential part to ensuring the integrity of Pearlman's Vintage Collection. The basic materials of wire and sheet are used as the first step to create our die struck and handmade jewelry. Every Pearlman's Vintage Collection piece of jewelry is manufactured using the die struck process. Hundreds of special dies have been handmade in our shop over the past 119 years. Our precious metal sheet is forged into dies under many tons of pressure to shape and form rings, pendants and earrings. The Pearlman's Vintage Collection is one of few jewelry collections that still manufacturing using the die struck method. This process produces a product that is far superior to the industry standard of casting. Die striking metal under extreme pressure creates a product 33% stronger and more dense than a casting. The benefit is a longer lasting product, secure settings for diamonds and gemstones, and a mirror-like luster unobtainable by other methods. A Pearlman's Vintage Collection piece of jewelry will begin to take form during hand assembly by our craftspeople. Filigree details are pierced using saw blades as small as a human hair. 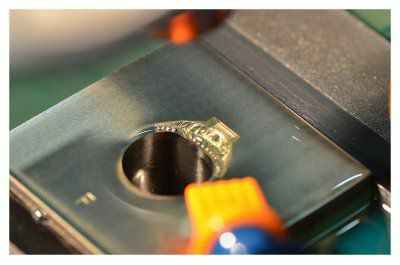 Each die struck component is individually polished to achieve the highest finish inside and out. 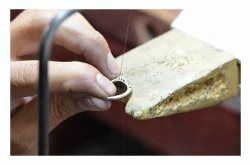 Welding and soldering techniques are used to assemble the blank shape from many parts. After assembly, the blank will be filed, sanded, and polished to a fine finish, creating the palette for the diamond setter and engraver to create their masterwork. A final polish is applied as the last detail. Bright areas are polished to the highest finish attainable. The final product is a piece of jewelry that feels and appears like no other. Pearlman's Vintage Collection has the quality and fine elegance that has been refined since 1930. Take a closer look at the Pearlman's Vintage Collection.